Welcome back to another edition of sharing some litera(l)y crafty inspiration. If you ask me, you can never go wrong with the classics, especially if you throw some craft projects into the mix. So in case you were unaware of this, I'm also book blogging over at The Book Garden and have devoted these giveaways to my passion for books and crafting. 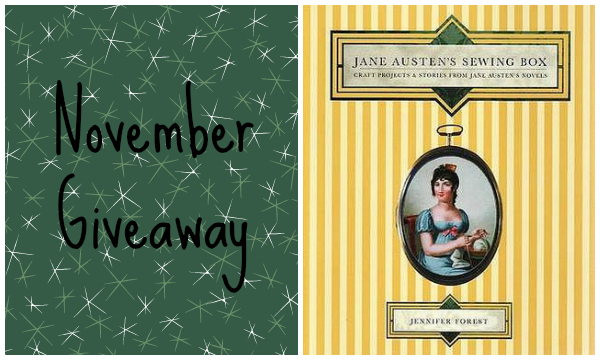 In this month's giveaway you can get your hands on Jane Austen's Sewing Box: Craft Projects & Stories from Jane Austen's Novels by Jennifer Forest! Congrats to Amber C. from Australia! This looks like a must-have for any Austen and crafts aficionado! Inspiration? I'm afraid my only creative Muse is as a writer, but I find Jane Austen the perfect inspiration, especially her characters! What a wonderful idea! I usually get inspiration from pinterest, though my projects don't always turn out like the inspiration picture. Pinterest also works for me. I get inspiration from many places. I do love Pinterest though! I get a lot of inspiration from Pinterest, but my projects never turn out as well! My inspiration comes from everywhere. Every book I read, images I see and people I talk to usually fills my mind with ideas. I get most of my crafty inspiration from thinking about making gifts for specific people but I supplement my ideas with Pinterest and with things I see in stores and think "I could make that". I consider myself a crafty person and a Jane Austen addict. This book give away satisfies both of those parts of my personality. I just seem to have the knack for thinking of ideas and figuring out how I am going to pull it off I usually use more than one "way" of doing things. I love crafts, I wish I had more time to work on things. I'd love to explore this book! I get inspiration at the things I look at such as newspapers, magazines and Internet. Sometimes it may not turn out to be exactly what I see but nevertheless I love what I can do with my limited abilities. I get my inspiration from Books although I like looking at all the Great ideas on Pinterest there is no step by step how to do it. I get my inspiration from many books and I am now in love with pinterest. I recently purchased a Jane Austen craft book and have enjoyed doing some of the projects. I would really like this book though because it has so much more to offer. I get a lot of inspiration from Pinterest! Usually from friends and of course from Pinterest! Mainly from friends and my children. I never run out of things to make because they always have requests. Usually an idea just starts in my head from something I've seen or heard. Of course these days it's so easy to go to Pinterest or even Google images and see how others have interpreted my idea subject, then my idea can turn into something real much more quickly. I'm also have crafty inspiration from my friends on Facebook and Instagram. Thank you for the lovely giveaway , I would be very glad if I'll win ! I got pinterest when I need crafty ideas, or my mom!